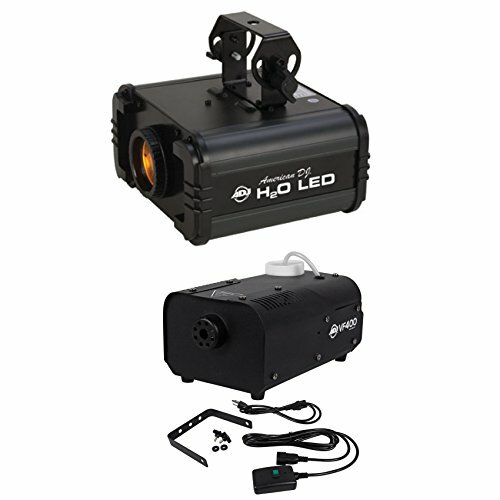 The American DJ H2O LED simulates hypnotic multi colored water flowing effect on any surface. Great for mood or background lighting you can turn a boring cement floor into a night amongst the waves. Keep the party going with six colors and three effect wheels. Seamlessly scroll through colors or pick a single one to project upon your dancers. Your guests won't know what hit them when not only the music but the atmosphere of the club comes alive in a myriad of colors and ripples. Long life 10W LED (30,000 hr. rating). Switchable voltage: 115V/60Hz or 230V/50Hz (IEC Plug), Dimensions (LxWxH): 8.75"x9"x7.5" / 222x229x187mm, Weight: 8 lbs. / 4 kg. Internal fog fluid tank: .5 Liter. Fluid level indicator, Includes ADJ VF400R wired remote. Only use high quality, water-based fog fluid, Unit Dimensions (LxWxH): 9.5" x 8" x 5.5" / 240x200x140 mm, Weight: 4 lbs. / 2 kgs.